The use of stand-off weapons such as cruise missiles and air-to-ground missiles reflects the US and its allies’ fear of Syrian and Russia anti-aircraft defense systems. Of course, the phrase, “associated with the chemical weapon capabilities” of Syria is intentionally ambiguous. If those chemicals had been released, as many as 60,000 people who live within reach of the ensuing vapor cloud could have faced death or serious injury, according to the plant’s worst-case estimate. 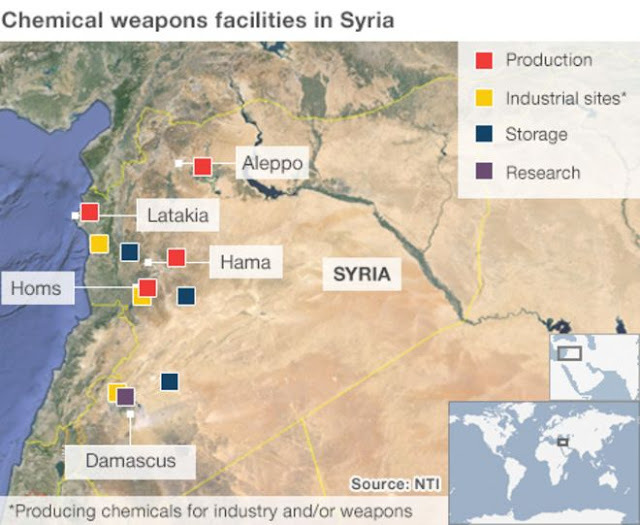 Obviously, US-led strikes on chemical facilities in Syria – had they existed – would have led to similarly catastrophic threats to the civilian population of Syria, calling into question both Washington’s credibility, and the alleged purpose behind this recent act of military aggression. This has added further suspicion surrounding US-UK claims regarding Douma. Both the US and the UK notoriously lied to the world ahead of the disastrous 2003 invasion and occupation of Iraq. It would later turn out that claims of Iraq having “weapons of mass destruction,” including chemical weapons, were intentional, fabricated lies. It was clear that the supposed poisoning of Sergei Skripal and his daughter Yulia Skripal in Salisbury, UK was engineered as an attempt to undermine Russia’s credibility within the United Nations Security Council (UNSC) ahead of a vote on action against Syria regarding the yet-to-be staged chemical weapons attack in Douma, northeast of Damascus. With this elaborate, but transparently baseless string of accusations being aimed at Syria and Russia now falling apart – falling short of simply withdrawing from Syria – the US and its allies have a limited number of options remaining for provoking a war it hopes can remove the Syrian government from power and reassert US hegemony over the Middle East. 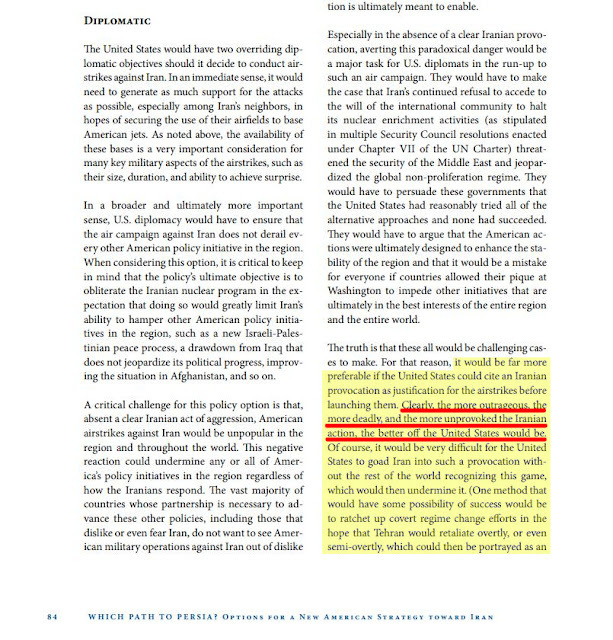 As many of Brookings’ recommendations for Iran have now been repeatedly used on Syria, this option may manifest itself in several ways. 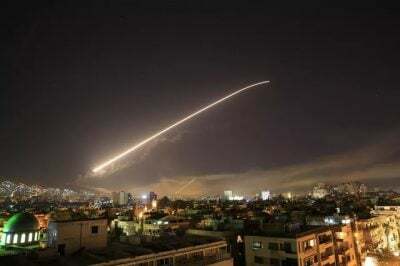 Before and after this most recent and impotent strike on Syria, Israel has claimed of an impending Iranian attack on its territory. Such an attack would – again – serve only as a pretext for the US and its allies to intervene in Syria amid a war Syria and its Russian and Iranian allies have already won. Israel may stage an attack on its own forces – or an attack on US, British, or French forces in the region may be staged. Unlike an alleged or staged chemical attack on civilians, staging a military attack on Western forces and their regional allies would allow an immediate and much larger military response. Russia’s ability to communicate clearly to US interests the finality of its commitment in Syria and the consequences of continued US military aggression in the region has already resulted in US hesitation. Despite the scale of the recent US attack, it was clearly an attack made out of desperate frustration – an attempt to “fall forward” – tripping over its clumsy pretext while trying to advance its agenda. In the process, it has compromised its agenda further, and further dulled the propaganda tools it has overused in relation to its floundering proxy war in Syria. Managing the eviction of the US from the Middle East will be a slow, arduous, and dangerous process that will require maximum patience and persistence. The Syrian government and its allies’ weathering of this recent attack once again proves that time is on their side and their collective discipline in the face of America’s increasingly reckless foreign policy will continue to confound and complicate US objectives. For the rest of the general public appalled by US military aggression and seeking ways to resist it – the continued support of, contribution to, and participation in the alternative media as well as the boycott and permanent replacement of the corporate special interests driving US foreign policy are viable options. Tony Cartalucci is a Bangkok-based geopolitical researcher and writer. He is a frequent contributor to Global Research.